WORLD CUP MASCOTS At the same time, I also found the mascots in world cup history. It was invented to the 1966 tournament in England. 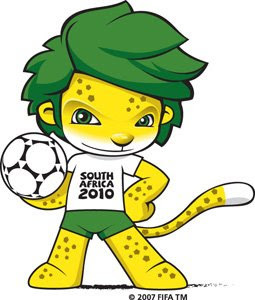 From then on, each world cup had their mascots. Today I received an e-greeting card from my Japanese's friend. I feel so happy and it's so cute. Today is my 11th Birthday, My dad and mum are busy on something........ I didn't expect to have a party this year but God is so good, He gave me favour that this year Aunt Lisa and Brother Khar Fye bought me KFC and a birthday cake. We have a dinner at Aunt Lisa's house. It was a very simple but a very warm birthday dinner. I also received so many birthday wishes from my friends in face book especially my church's members. It's so touch when received their greeting. It's so great that facebook can remind us when is our friend's birthday. I think everyone will happy if our friends remember our birthday and give us greeting. My parents brought me to the 2nd PutraJaya International Hot Air Ballon Festa, we reached Putrajaya at 6.30pm. There was so crowded and we were hard to get the parking, we were a bit late since the hot air ballons were started to fly at 6.00pm. Anyway, I still get to see many hot air ballons. There were so many countries participated the event. We couldn't capture some every cute and special ballons like The Darth Vader, Lion Face, Orange, because they were already fly higher in the sky, please click this link ballonsto see. It was really very beautiful. I think this is the biggest hot air ballon on that day It was from Netherland, and it was looked like combined so many ballon to make a big hot air ballon. My blogger friend from Australia is coming to Malaysia next week. Here are some nice travel points and info about Malaysia. Kuala Lumpur - the city of Malaysia. 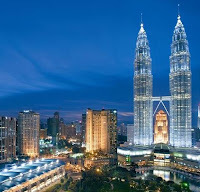 Travel points: KLCC, KL TOWER, PETALING STREET ( CHINA TOWN ), CENTRAL MARKET.... KLCC, the heart of Kuala Lumpur. the most popular landress in Malaysia., it's also a popular tourist destination. Attraction: Petronas Twin Towers, KL Tower, Auaria KL, Petronas Sains, shopping central.... High Light: Kinokuniya Japanese Book Store, Madam Kwan's restaurant selling the delicious Nasi Lemakand Nasi Bojari. Petaling Street (China Town ) is a shopping street, various items are sold here, you must bargain at least until half price. Attractions in Petaling Street: Koon Kee Wan Tan Noddle, Kiew Brothers (Wo Lai Ye) dried meat, so many tourist like to buy this as sourvenir snack :), Lo Hon Guo & Longan drinks don't miss it! Holiday has come . . . . . .
Today is International Women's Day, I gave my mum rest for one day, I prepared my lunch by myself. I cooked some pancakes since it is not too difficult to cook. 1 pack of chocolate milk, 3 pancakes and Australian honey and strawberry jam was my lunch for today. I wish my Mum, Aunts, Sisters........ all of you women a Happy International Women's Day! The first semester exam is from 01/03/10 to 05/03/10, I put on the head band with the word "必胜" SUCCESS when I was doing my revision. Dad bought this head band during the japan trip. Mum cooked a bowl of porridge for me, I used Brovil to write my name on the porridge before I ate it. When I wrote my name on the porridge it reminded me of the "Latte Art", haha...... maybe next time I can try to draw a design on it.